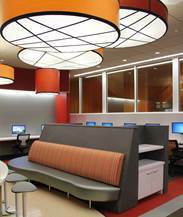 This project was a complete build out for a new Honors Library. This facility was built for Dean’s List students only, as a reward for their hard work. This space quickly became a very high profile area and is definitely one of our finest small projects to date. Your Full-Service Electrical Contractors | ©2011 RANDM | Developed by NuMedia Marketing, Inc.